If you’re looking for the best SEO courses to step up your SEO game, you’ve come to the right place. 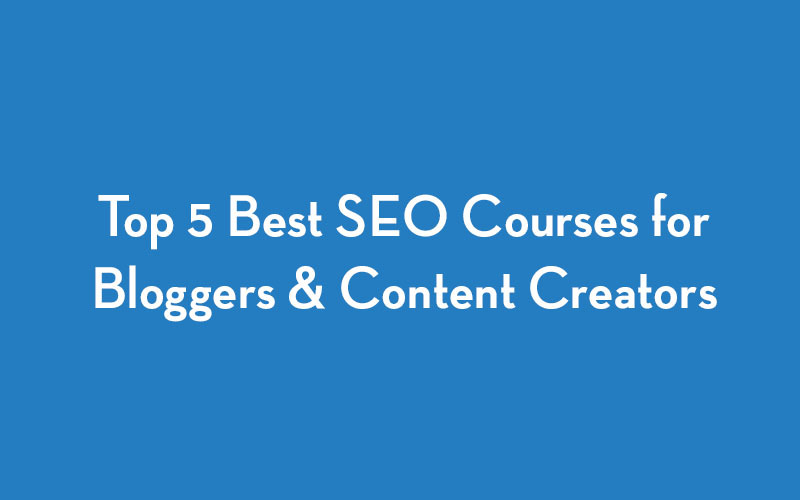 We’ve curated the top 5 SEO courses for bloggers – some free and some paid – to help jumpstart your blog to the top of search engines. Mastering the art (and science) of SEO will allow you to create valuable and searchable content to attract new website visitors, and then place it in front of them so they can easily find it. SEO is a moving target but setting a solid foundation will bring your website traffic and hopefully much deserved revenue. Here are the 5 best SEO courses that will help you achieve that goal! Why We Like Moz: The Moz Academy has a variety of different courses which include crucial SEO knowledge like building backlinks and keyword research. Their courses are not free, but they are a well respected name in the SEO industry and a great place to start if you’ve got a budget to purchase courses with. Moz also has a free SEO for beginners guide that provides an overview of crucial SEO terminology. Why We Like Search Engine Land: Pictures are worth 1,000 words! Although this is not technically a course, it’s an amazing quick reference guide providing a visual representation of elements of SEO. These reference guides are crucial to brush up on existing knowledge or to complement one of the other courses on this page. And hey, it’s a bonus if you’re a visual learner too! Why We Like Yoast: Yoast is a very popular SEO plugin that helps you optimize your posts on WordPress, so it’s a natural transition for the company to offer SEO guides. Their SEO for beginners is perfect if you’re a newbie because it provides insight into using their plugin and crucial tips to get some quick wins under your belt. It also does a nice job of helping you understand how and why search engines rank pages the way they do. If the beginner course isn’t enough, there is a full Yoast Academy to drill down on your skills further. Why We Like ClickMinded: ClickMinded brands themselves as the place where startups, agencies and entrepreneurs learn SEO. So if you have a group of people needing to learn this skill, ClickMinded has a proven model for you. There are also many elements to the course such as content marketing, email marketing, paid advertising, social media courses, and Google Analytics. So you will be sure to not only learn SEO, but the key elements that will have synergistic effects on SEO. Why We Like Internet Crash Courses: We created Internet Crash Courses as audio courses because they allow us to learn on the go. And like you, we’re constantly on the move so we appreciate the ability to take a quick lesson when driving, traveling, or anytime that we’re not sitting in front of a computer. Our SEO For Beginners Crash Course focuses on the what, why, and how of search engine marketing and is a great starting point for complete newbies to the world of SEO. In the future, we’ll be putting out additional courses that cover advanced SEO topics. Price: $29 dollars for a lifetime subscription. New courses released every week. There you have it. The 5 best SEO courses to step up your search optimization game including our own SEO For Beginners crash course. We look forward to seeing you on the first page of Google! Internet Crash Courses are short value-packed audio interviews with experts. They are designed specifically to provide as much information in as little time a possible about a particular subject to bloggers, vloggers, and content creators. Learn more short, value packed, and easy to digest courses that will provide you with actionable steps that you can implement immediately.